(May 19) Open the Borders! Refugees Welcome! Stop the Racist Far-Right! 1. a call-out for the May 19th mobilisation against racists at the "Roxham Rd" border crossing point. "A callout by Solidarity Across Borders, Montreal Antifasciste and allied groups and individuals. Far-right racists are again mobilizing to try to intimidate refugees who are crossing the border from the US to Canada at Roxham Road. Their racist organizing is being supported, directly and indirectly, by sensationalist media and demagogic politicians. 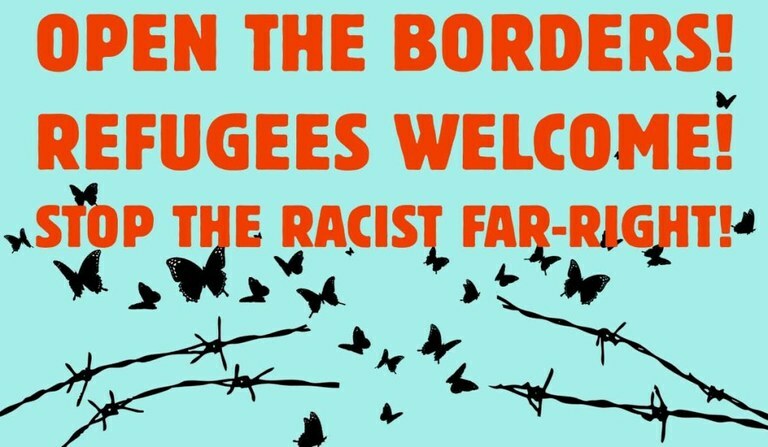 Migrant justice anti-racists in the Montreal-area are calling for a large-scale mobilization at Roxham Road to show our support for open borders and to welcome migrants. Our presence — festive, diverse, and in large numbers — will also effectively block the far-right racists from getting anywhere near the border (similar to mobilizations undertaken last year at both Roxham Road and Lacolle) and prevent their harassment of asylum seekers." 2. canada's negotiations with america to turn the entire land border into a "crossing" to make it easier to reject asylum seekers. hussan also goes on to question the canadian government's construction of a 500 person migrant processing facility near the Lacolle and Roxham Rd border crossings, reminding folks that this could become a detention center unless pressure is kept on the canadian government and it is shown that all asylum seekers are welcome. "Minister @AhmedDHussen says Safe Third Country Agreement is "good" for Canada. Doesn't explain how. Why can't refugee seekers decide where they want to live? Why must they apply and stay in the US just because they landed there first? Freedom to choose is critical." @andterry went to the event and reported an overall "nothing burgar" with a healthy dose of racism. "I can't stress this enough. The speaker offered zero evidence or data to back up her claims and offered o ly personal andecdotes and some drivel about laywers being the only ones benefiting from indigenious study." 5. the canadian anti-hate network (CAN) has launched and will work to track far-right movements and people in canada similar to the SLPC in the states. anti-racistcanada.blogspot.ca says: "The Canadian Anti-Hate Network will be another incredibly useful tool in the fight against bigotry in Canada." music from Evan Catalano, with a cover of End Game's boy named me from the rebels sing tribute album to the rebel spell.